Oversized nucleotide repeat expansions in two genes, ataxin 2 and C9ORF72, boost carriers’ risk for amyotrophic lateral sclerosis, frontotemporal dementia, or a combination of both. The discovery of these two disease genes inspired clinicians around the globe to count repeats in their own patient cohorts, and in the September 9 Neurology, The French Research Network on FTD and FTD-ALS publish news on ataxin 2. They found that, in their study population, repeats in the gene tracked with ALS and ALS-FTD, but never pure FTD. Moreover, when a person carries both C9ORF72 and ataxin 2 expansions, they are more likely to exhibit ALS rather than FTD symptoms than if they had only the C9ORF72 expansion. Scientists now have to figure out why the ataxin 2 expansions seem to always harm motor neurons but only sometimes attack neurons in the frontal cortex. The ataxin 2 gene contains a stretch of glutamine codons, CAG or CAA, that number 22-23 in healthy people. If this repeat number is greater than 33, it causes spinocerebellar ataxia type 2. In 2010, researchers reported that repeat lengths between 27 and 33 increase risk for ALS but intermediate-length repeats also occur in healthy people (see Aug 2010 news story). There is no precise cutoff between healthy and ALS risk, and the number of repeats associated with disease likely varies among populations, noted Vivianna Van Deerlin of the University of Pennsylvania Perelman School of Medicine in Philadelphia, who was not involved in the current study. One recent meta-analysis determined that 30-33 repeats most strongly increased ALS risk (Wang et al., 2014). The original study linking ataxin 2 repeats and ALS was performed with cell lines from an American repository. Since then, researchers have confirmed the link in patient cohorts from Canada, China, and several European countries (Van Damme et al., 2011; Corrado et al., 2011; Daoud et al., 2011; Sorarù et al., 2011; Conforti et al., 2012; Gellera et al., 2012; Liu et al., 2013). At the other end of the ALS-FTD spectrum, researchers have found no evidence for ataxin 2 expansions in FTD or FTD-ALS (Van Langenhove et al., 2012). However, only about two dozen people with FTD-ALS have undergone ataxin 2 genotyping. In the new French study, first author Serena Lattante and senior author Edor Kabashi of the Institute du Cerveau et de la Moelle Épinière in Paris focused on those people with combined symptoms in a large population. Lattante and Kabashi, in collaboration with a network of other clinicians and geneticists, measured the length of ataxin 2 repeats in 168 people with a diagnosis of FTD-ALS as well as 1,144 diagnosed with ALS and 203 with FTD. They also examined 109 people with progressive supranuclear palsy (PSP), which was associated with ataxin 2 repeat length in another study (Ross et al., 2011). In ALS, Lattante and colleagues confirmed the ataxin 2 risk; 29 or more repeats were associated with motor neuron disease. The FTD cases, in contrast, had the same spread of repeat numbers as healthy controls, suggesting no influence on this disease (see image above). 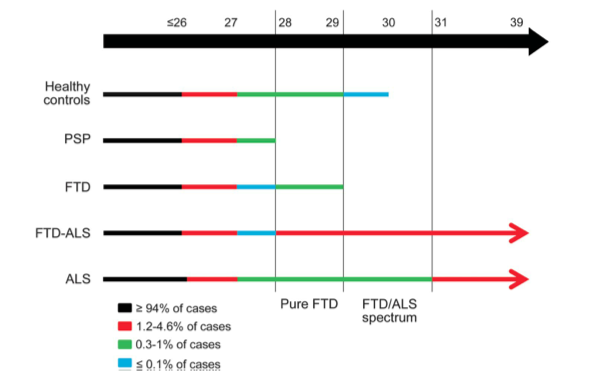 For the FTD-ALS cases, again 29 or more repeats associated with disease. It appears that expanded ataxin 2 always pushes people toward a phenotype that includes ALS, and never causes pure FTD, suggested the authors. In keeping with this, PSP cases had repeats sizes similar to controls, contrasting the earlier report. That may be due to differences in populations studied, the authors suggest; the previous study dealt with PSP cases from an American brain bank. Next, the authors examined how ataxin 2 expansions interact with those in C9ORF72, the most common genetic cause for ALS and FTD. Healthy folks can have between two and 23 GGGGCC hexanucleotide repeats in intron 1 of C9ORF72. For this gene, too, the exact cutoff between normal and disease is uncertain, but people with ALS or FTD can carry hundreds of the repeats. In their cohort, Lattante and colleagues identified 322 people with more than 23 C9ORF72 expansions: 202 had ALS, 57 had FTD, and 63 had FTD-ALS. Three percent of those subjects possessed expansions in ataxin 2 as well as C9ORF72, but all of them carriers had either ALS or FTD-ALS, never FTD alone. “The presence of the ataxin 2 expansion could drive the clinical phenotype toward the ALS side of the FTD-ALS spectrum,” the authors conclude. The work confirms a study earlier this year that also suggested ataxin 2 could modify the phenotype of C9ORF72 expansion carriers (Van Blitterswijk et al., 2014). The link between ataxin 2 and FTD-ALS was not entirely suprising to van Deerlin, because scientists already consider FTD and ALS to be the ends of a continuous spectrum of disease. Both she and Alice Chen-Plotkin, a colleague at the Perelman School of Medicine who was also not involved in the study, found the lack of pure FTD cases in ataxin 2 carriers interesting. However, Chen-Plotkin pointed out, the French study had far fewer FTD cases than ALS cases. It remains possible that the authors simply did not examine enough FTD cases to find some with ataxin 2 expansions, Chen-Plotkin said. If the dearth of ataxin 2 expansions in pure FTD holds up, it would imply that ataxin 2 somehow contributes to the regional specificity of neurodegeneration in ALS, Chen-Plotkin noted. Indeed, Kabashi said, “The big challenge is to take the genetic information and functionally explain it.” He plans to study the mechanisms of ataxin 2 and C9ORF72 defects in animal models. Given that both are expansions, Chen-Plotkin hypothesized that repeat-heavy nucleic acids might sequester RNA binding proteins, with a “double whammy” effect in the case of people who have both mutations. Wang MD, Gomes J, Cashman NR, Little J, Krewski D. Intermediate CAG repeat expansion in the ATXN2 gene is a unique genetic risk factor for ALS--a systematic review and meta-analysis of observational studies. PLoS One. 2014;9(8):e105534. Epub 2014 Aug 22 PubMed. Sorarù G, Clementi M, Forzan M, Orsetti V, D'Ascenzo C, Querin G, Palmieri A, Ermani M, Angelini C, Pegoraro E. ALS risk but not phenotype is affected by ataxin-2 intermediate length polyglutamine expansion. Neurology. 2011 Jun 7;76(23):2030-1. PubMed. Conforti FL, Spataro R, Sproviero W, Mazzei R, Cavalcanti F, Condino F, Simone IL, Logroscino G, Patitucci A, Magariello A, Muglia M, Rodolico C, Valentino P, Bono F, Colletti T, Monsurrò MR, Gambardella A, La Bella V. Ataxin-1 and ataxin-2 intermediate-length PolyQ expansions in amyotrophic lateral sclerosis. Neurology. 2012 Dec 11;79(24):2315-20. PubMed. Gellera C, Ticozzi N, Pensato V, Nanetti L, Castucci A, Castellotti B, Lauria G, Taroni F, Silani V, Mariotti C. ATAXIN2 CAG-repeat length in Italian patients with amyotrophic lateral sclerosis: risk factor or variant phenotype? Implication for genetic testing and counseling. Neurobiol Aging. 2012 Aug;33(8):1847.e15-21. PubMed. van Blitterswijk M, Mullen B, Heckman MG, Baker MC, DeJesus-Hernandez M, Brown PH, Murray ME, Hsiung GY, Stewart H, Karydas AM, Finger E, Kertesz A, Bigio EH, Weintraub S, Mesulam M, Hatanpaa KJ, White CL 3rd, Neumann M, Strong MJ, Beach TG, Wszolek ZK, Lippa C, Caselli R, Petrucelli L, Josephs KA, Parisi JE, Knopman DS, Petersen RC, Mackenzie IR, Seeley WW, Grinberg LT, Miller BL, Boylan KB, Graff-Radford NR, Boeve BF, Dickson DW, Rademakers R. Ataxin-2 as potential disease modifier in C9ORF72 expansion carriers. Neurobiol Aging. 2014 Oct;35(10):2421.e13-7. Epub 2014 May 2 PubMed. Lee T, Li YR, Chesi A, Hart MP, Ramos D, Jethava N, Hosangadi D, Epstein J, Hodges B, Bonini NM, Gitler AD. Evaluating the prevalence of polyglutamine repeat expansions in amyotrophic lateral sclerosis. Neurology. 2011 Jun 14;76(24):2062-5. PubMed. Yu Z, Zhu Y, Chen-Plotkin AS, Clay-Falcone D, McCluskey L, Elman L, Kalb RG, Trojanowski JQ, Lee VM, Van Deerlin VM, Gitler AD, Bonini NM. PolyQ repeat expansions in ATXN2 associated with ALS are CAA interrupted repeats. PLoS One. 2011;6(3):e17951. PubMed. Gispert S, Kurz A, Waibel S, Bauer P, Liepelt I, Geisen C, Gitler AD, Becker T, Weber M, Berg D, Andersen PM, Krüger R, Riess O, Ludolph AC, Auburger G. The modulation of Amyotrophic Lateral Sclerosis risk by ataxin-2 intermediate polyglutamine expansions is a specific effect. Neurobiol Dis. 2012 Jan;45(1):356-61. PubMed. Lattante S, Conte A, Zollino M, Luigetti M, Del Grande A, Marangi G, Romano A, Marcaccio A, Meleo E, Bisogni G, Rossini PM, Sabatelli M. Contribution of major amyotrophic lateral sclerosis genes to the etiology of sporadic disease. Neurology. 2012 Jul 3;79(1):66-72. PubMed. Yamashita C, Tomiyama H, Funayama M, Inamizu S, Ando M, Li Y, Yoshino H, Araki T, Ichikawa T, Ehara Y, Ishikawa K, Mizusawa H, Hattori N. The evaluation of polyglutamine repeats in autosomal dominant Parkinson's disease. Neurobiol Aging. 2014 Jul;35(7):1779.e17-21. Epub 2014 Jan 25 PubMed. Charles P, Camuzat A, Benammar N, Sellal F, Destée A, Bonnet AM, Lesage S, Le Ber I, Stevanin G, Dürr A, Brice A, . Are interrupted SCA2 CAG repeat expansions responsible for parkinsonism?. Neurology. 2007 Nov 20;69(21):1970-5. PubMed. van den Heuvel DM, Harschnitz O, van den Berg LH, Pasterkamp RJ. Taking a risk: a therapeutic focus on ataxin-2 in amyotrophic lateral sclerosis?. Trends Mol Med. 2014 Jan;20(1):25-35. Epub 2013 Oct 16 PubMed.